Established in 2013, TrustRadius has become the most trusted site for B2B software reviews. Each month, about 400,000 B2B technology buyers use over 120,000 verified reviews and ratings on TrustRadius.com to make informed purchasing decisions. According to reviews from verified users in the Marketing Automation Software category, HubSpot fulfills its mission of helping organizations grow better. HubSpot’s scorecard demonstrates that our users are likely to recommend HubSpot to others (8.3 out of 10), are very likely to renew (9.4 out of 10) and think highly of HubSpot’s usability (9.5 out of 10). HubSpot Marketing Hub is part of the HubSpot growth platform, which also includes Sales Hub, Service Hub, and a powerful free CRM. 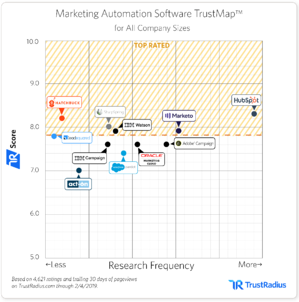 As of February 6, 2019, HubSpot had 1,332 reviews and ratings in the Marketing Automation category on TrustRadius. Click here to see what our users have to say about HubSpot or share your own review. To learn more about how TrustRadius Top Rated works, check out the TrustRadius scoring criteria breakdown.